Composed of a selection of top of the line contents, these President of the Fun Club Funny Name Plate will help to make certain that you don't lose your sense of humor while at work! Nothing says a fun workplace quite like a funny high quality desk name plate! 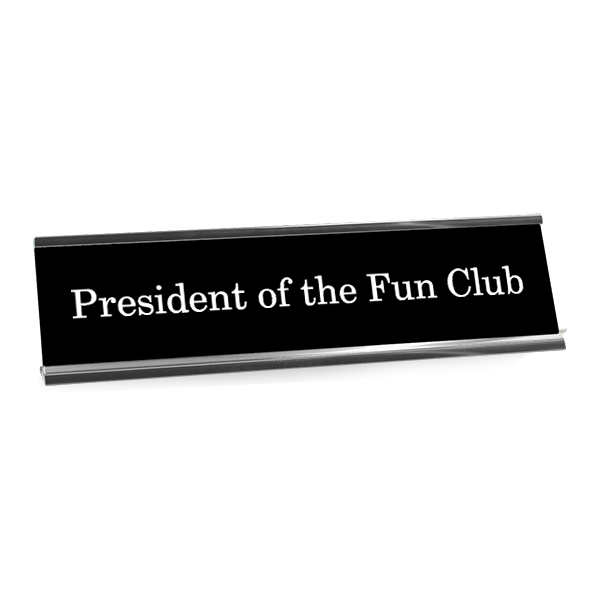 Great for any casual office setting, this President of the Fun Club Funny Name Plate is a great way to add some flair to your office, made available in a wide assortment of designs for your choosing. All of our name plates are engraved on durable plastic and have been handmade to endure for many years to come. Name plate insert slides out for easy assembly and replacement. This President of the Fun Club Funny Name Plate measures 2" x 8" and bring just the perfect level of merriment to any workplace. Buy yours here!